If you long for curly hair, you have a few options for creating those attractive curls and waves. Hair perms use strong chemicals to create curls and may be harmful if you have sensitive skin, allergies or are chemically-sensitive. Curling irons and hot rollers can damage your hair over time. Sponge curlers are made out of a soft foam material with a built-in plastic clip; they gently secure the hair around each roller, and won't hurt your hair or scalp. Setting your hair with sponge curlers can give you the same curly locks that you'd pay top dollar for at a professional hair salon, without the high expense. Shampoo your hair and apply a leave-in hair conditioner. Comb your hair to remove any tangles, and towel dry, leaving it damp. Part your hair down the middle with a comb, and divide your hair into two sections. Secure each hair section with a large hair clip. Divide your hair into four or five sections if you have thick or very long hair, and hold the sections in place with hair clips. Apply hair gel to one-inch sections of your hair. Roll each section, starting from the ends of your hair, onto a sponge curler. Keep rolling your hair around the sponge curler until you reach the roots of your hair for a tight curl and snap the roller into place using its attached clip. Create softer curls by only rolling the sponge curler around the ends of your hair or halfway up the length of the hair, and use the curler's attached clip to keep it in place. Continue rolling 1-inch sections of your hair around the sponge curlers until you've rolled all your hair. Spray a hair setting lotion over your hair. Leave the sponge curlers in place until the hair is dry---which should take two to three hours---or overnight. Remove the sponge curlers slowly to avoid tangling or pulling your hair. Gently unravel the hair from the sponge rollers to keep the curls intact. Use your fingers to separate each curl. Spray with a light hairspray to hold the curls in place. Use hair care products specifically formulated to help create curly hair, such as shampoo, hair conditioner and style-setting gel. 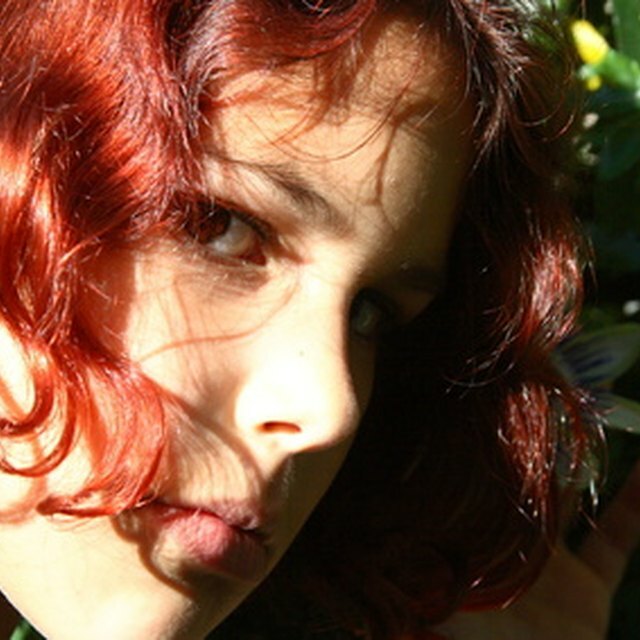 Hair care products designed for curly hair will be clearly stated on their labels. "Fashion Asia: How to Curl Your Hair With Sponge Curlers"
"Beauty-Advices.com: How to Curl Your Hair With Rollers at Home"